Like many Cambodians, I’m noticing changes in the weather in my country. The temperature is getting hotter, floods and storms are happening more frequently, and our dry season is longer than ever before. With 75% of the population living in rural areas and relying on farming or fishing to make a living, these weather changes are already having a big impact on people’s lives and livelihoods. I helped conduct BBC Media Action’s newly-published research exploring how people across Cambodia are experiencing these weather changes, and whether or not they’re doing anything about them. The report outlines priority audiences, the challenges they are facing in responding to climate change, and tips for how media professionals can communicate climate issues to them more effectively. We interviewed 1660 people across five regions of Cambodia, and conducted in-depth community discussions. Most people (85%) who we surveyed felt that the weather changes could be having an effect on their health. 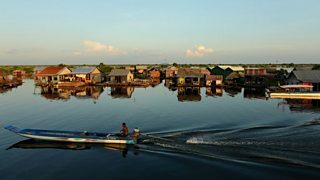 When I visited Anlong Raing community in the Tonle Sap region, for instance, many people told me they thought their children had been getting diarrhoea more often, and in some cases more serious diseases like Typhoid. People also felt that weather changes were affecting their income (81%), and what’s more, we discovered that rather than take simple steps such as changing their farming methods, people were more likely to make big life changes in order to get by - 33% said they had changed their job as a result. That’s where our brand new TV documentary series – Don’t Wait For Rain – comes in. Informed by our research, the show aims to improve knowledge of climate risks and encourage Cambodians to make easy and affordable changes to become more resilient to the changing climate. We filmed in locations across Cambodia to showcase the real weather issues people are facing – from flash flooding in the mountainous area of Kampong Speu province to lower fishing yields in the Tonle Sap. For me, one of our most interesting findings is that there is often a social barrier to adapting to climate change. In our survey, 37% of respondents said that they weren’t responding to climate change due to being fearful of discussing actions with others, and 35% said that it didn’t fit with their religious beliefs or community culture. This was an important insight which we reported to the TV production team. We knew that trust would be a key factor when helping people adapt to new techniques, and that audiences would need to see people they could relate to in the show adapting successfully to be encouraged to try it out for themselves. That’s why in each episode we pair up an ‘impact’ community struggling to cope with the weather with local experts who have overcome climate challenges. For example, in one episode, audiences see a female farmer called Ming Mao who lives in Central Cambodia. Ming Mao felt helpless when all of her crops were washed away by flood waters, an increasingly common risk in her region. We paired her with a local expert who teaches her how to build a raised vegetable garden to grow food above flood levels. When she’s revisited later in the episode after another flooding, Ming Mao’s new garden has remained completely untouched! My hope is that Don’t Wait For Rain proves to be a hit with our audiences and helps them to better cope with the weather challenges we’re currently facing, and will face in the future. I also hope that other media organisations will use our research findings to tailor their own communications, helping even more Cambodians to adapt. At the very least, I believe the show will prompt awareness of these weather changes and lead to families and communities questioning what more they could do to prepare for further unpredictability. But of course, what I really want is for people to take action! Khuon Chandore is the former Research Manager for BBC Media Action Cambodia. Our factual TV series Don’t Wait For Rain is on air nationally in Cambodia from late February until May 2019. The show is part of our Neighbours Together project, funded by Sida, which also includes outreach activities and social media. To discover more about how people from other countries in Asia are experiencing climate change, check out our Data Portal where you can find further data from our Climate Asia series.